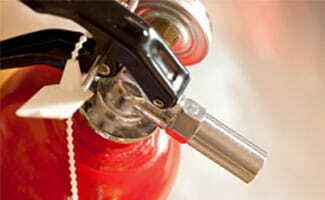 Having a fire extinguisher (or several) in your home should be a key part of your family’s fire safety plan. But it can be tricky to know what kind of fire extinguishers there are, and which to buy. Then, once you’ve chosen one, how do you use it and what do you do with it afterward? We’ve got all the information you need about fire extinguishers how to use them, and which ones we recommend. Each fire extinguisher lists different ratings, which are expressed with a combination of numbers and letters. Before we get to our recommendations, we’ll explain what those ratings mean. There are five classes of extinguishers, each of which works on a different type of fire. Some extinguishers are rated for multiple uses and are labeled B:C or A:B:C. These are the most common for homes and other areas where multiple fire types are possible. Unless you work in a factory or commercial kitchen, you don’t need to worry about using Class D or Class K fire extinguishers. You’ll also see numbers before A and B classifications. The bigger the number, the more extinguishing agent the extinguisher uses. There is no number before a Class C because the C indicates that the materials are nonconductive and therefore safe to use on an electrical fire. The number before a Class A extinguisher represents the equivalent number of gallons of water times 1.25, so a fire extinguisher with a 3-A classification has enough extinguishing agent to be the equivalent of 3.75 gallons of water. The number before a Class B is the maximum square footage the agent can cover, so a 40-B extinguisher has a maximum coverage of 40 square feet. For a home fire, the National Fire Protection Association (NFPA) recommends choosing a multipurpose extinguisher that can put out a small fire, isn’t too heavy to handle, and has been reviewed by an independent testing laboratory. 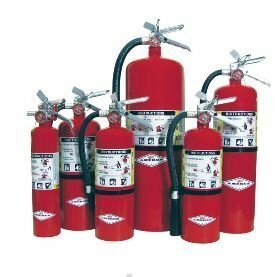 Home fire extinguishers should have a minimum classification of 2-A:10-B:C.
Our top pick for a home fire extinguisher is the Amerex B402, a multipurpose dry chemical extinguisher that works on all types of fires. 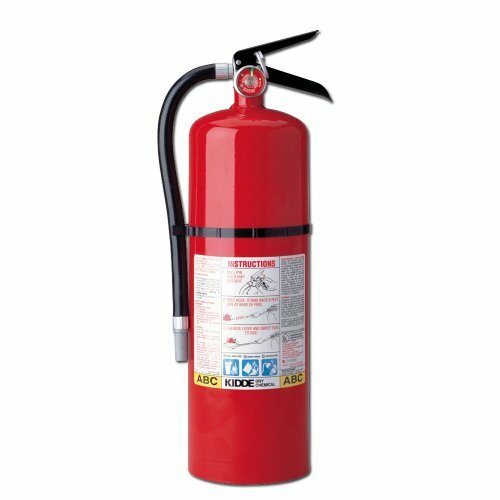 The B402 has a higher classification (3-A:40-B:C) than other Amerex fire extinguishers, which translates to more materials and a larger square area of coverage. The Amerex’s all-metal valves mean the extinguisher is refillable, making it more cost effective than nonrefillable extinguishers. The B402’s 14-second discharge time should be long enough to put out small household fires, and its 18-foot range will keep you well clear of the flames. It comes with a pressure gauge and a wall mount, though at just over 15 inches tall, the Amerex could fit in a cabinet if needed. The only possible downside is that the Amerex extinguisher can be difficult to find in stores, so you may need to purchase it online. Overall, the Amerex B402 is a solid, dependable choice for a home fire extinguisher—exactly what you’d want in an emergency. Our second choice for a home fire extinguisher, the First Alert PRO5, is similar to the Amerex B402. It’s a multipurpose dry chemical extinguisher with a 3-A:40-B:C classification, making it more than capable of handling small fires. It has all metal valves, so it can be refilled, and it comes with a mounting bracket. It is slightly larger than the B402, but it may still fit in a cabinet or cupboard. The potential downside is that First Alert is somewhat expensive; however, it comes with a 10-year warranty and is more widely available than Amerex extinguishers. In a workshop or garage, fires may start and spread quickly without anyone immediately realizing. You’ll want to get a heavy-duty fire extinguisher in those areas to ensure it can handle the blaze. These differ from household extinguishers in terms of size, agent amounts, and ratings, but are otherwise similar. The Kidde Pro 10M fire extinguisher, with a 4-A:60-B:C rating, is our top pick for a garage or workshop space. This heavy-duty extinguisher holds 10 pounds of chemical agent for a discharge time of up to 21 seconds and a range of 20 feet. If a fire starts and spreads quickly, this extinguisher has a good chance to contain it. As with our other top picks, the Kidde is made with all-metal valves, so it’s refillable. Because it’s a heavy-duty extinguisher, it’s more expensive than other extinguishers—and at 16 pounds and almost two feet tall, it may be more difficult to handle. We also wish it had a longer warranty than six years, since a garage extinguisher is likely to be stored for a long time. However, its large amount of extinguishing agent is exactly what you want in a space that contains lots of flammable materials. With 10 pounds of extinguishing agent, the Amerex B441 has a range of 21 feet and a discharge time of about 20 seconds, making it ideal for larger fires. It has a slightly higher rating of 4-A:80-B:C, which is ideal for a potentially very flammable area. On the downside, it’s slightly heavier at 19 pounds, and quite a bit more expensive. Even though we like the Amerex brand, we named this extinguisher the runner-up because it is heavier and therefore trickier to use, and some users report that it is heavy enough to be difficult to mount on a regular wall. Those drawbacks, plus the high price, put it in second place despite its high fire rating. For a car fire, FEMA cautions consumers to use a fire extinguisher approved only for class B and class C fires, and both of our picks follow these guidelines. 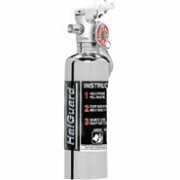 Our top pick for an automobile extinguisher is the H3R Performance HG100C. This extinguisher uses a clean-agent chemical called Halotron to put out class B and class C fires. Clean agents are better for vehicles because dry chemicals can damage electrical wires and metal engine parts if not cleaned right away, which won’t happen with a clean agent. The tradeoff, however, is that halogenated extinguishers are expensive and can be more difficult to get refilled. The price is the only other drawback, though, and the HG100C has several other features that make it an excellent choice. It is only about 10 inches tall, so it fits easily in small cars, and it comes with a car mounting bracket to keep it secure and accessible. It also has a range of six to eight feet, so you can stand well away from the flames during use. It has a smaller coverage area than similar extinguishers, but this is outweighed by the effectiveness of the clean agent. For a more budget-friendly option, we recommend the First Alert FIAFESA5, with a 5-B:C classification. It uses dry chemicals to put out small fires you’d find in cars, so be sure that all the residue is cleaned as quickly as possible to avoid additional damage to your engine. At only three pounds and under a foot tall, the First Alert fits easily in a vehicle, and it comes with a mount so it won’t roll around under the seats. However, it is not refillable, so it will need to be replaced if it’s ever discharged. First Alert extinguishers have consistently great reviews from users, and the FIAFESA5 is a reliable fire extinguisher to keep in your vehicle. Fire extinguishers use several types of extinguishing agents, but not all agents are approved for use on all types of fires. Make sure you know what kind of extinguisher you have so you don’t use it on the wrong type of fire. For example, a water-based extinguisher should never be used on an electrical fire, as the water will conduct electricity and create a shock hazard. Because a dry chemical extinguisher can be used on all types of fires, it’s the most common type of fire extinguisher and one that we recommend for homes. Please note that you need to clean up the dry chemical agent as quickly as possible, as it is corrosive. This is especially important in the kitchen where many fires start and where there are many metal appliances. Note: While aerosol canister fire extinguishers may seem appealing, we do not recommend them. 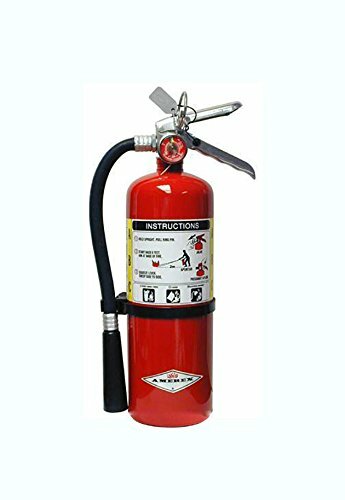 They are less effective (most are labeled as fire suppressants instead of extinguishers) and are not intended to replace a regular fire extinguisher. They also do not carry the same UL ratings and don’t have pressure gauges, so they may not work correctly. Pull the pin and release the locking mechanism. Aim low and point the extinguisher at the base of the fire. Where should you store a fire extinguisher? You should have one fire extinguisher on each level of your house and one in the garage. Place extinguishers near an exit and mount them three to five feet off the ground to keep them out of reach of small children. Do not place extinguishers directly next to a heat source—you won’t be able to access an extinguisher under the kitchen sink next to the stove if there is a stove fire, for example. If you store your fire extinguisher in a cabinet or cupboard, make sure that items around it don’t block it. Periodically check that your fire extinguishers are accessible, aren’t damaged or rusted, and are still pressurized (many extinguishers have gauges that indicate when the pressure is too high or low). Some extinguishers also need to be shaken on a regular basis, so be sure to read the manual that comes with your extinguisher. Refillable extinguishers should be professionally inspected every six years. A disposable extinguisher does not need to be serviced but has a shelf life of 12 years—and that’s if you don’t use it at all. Even a partial or accidental discharge renders the extinguisher ineffective, so replace a disposable unit immediately after use. Once an extinguisher has been used, even partially, it needs to be refilled or replaced. 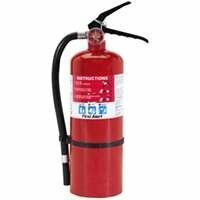 If your extinguisher valves are made entirely of metal, your extinguisher can be refilled for a small fee (often around $15). We recommend using extinguishers with all-metal valves for two reasons. First, they are more cost effective. Second, plastic valves can crack and leak with age, and those extinguishers are more likely to be recalled. Check with your local fire department or contact a fire safety equipment dealer to service and refill your extinguisher. If you have a disposable fire extinguisher, contact your local fire department for instructions on how to dispose of it. Many fire departments will dispose of them for you. If you want to throw an extinguisher away yourself, make sure to discharge it and even let it sit for a few days to make sure it’s fully depressurized. Water-based and carbon dioxide extinguishers are not hazardous to the environment and can be wrapped in a trash bag and thrown away with the trash. Dry chemical and halon extinguishers are sometimes considered hazardous even if they are empty, so you may need to take them to a hazardous waste center. While the amount of information about fire extinguisher types, classifications, storage, and upkeep may seem overwhelming, it’s worth the time and effort to understand exactly what you need and what you have. Using the wrong type of fire extinguisher can bring about disastrous results, as can using a fire extinguisher incorrectly or failing to have the unit serviced by a professional. The most important thing is to have a clear fire safety plan for your family with a fire extinguisher placed effectively in your home.